I love the Muppets. They have been a firm part of my childhood. I remember the Muppet Show as a kid when it was originally on and not in re-runs. My favorite episodes include the one with Mark Hamill (who can forget the best Pigs in Space segment ever) and Julie Andrews who sang Lonely Goatherd. My favorite Muppets are Rowl (he is such a cute dog that plays the piano) and the Swedish Chef. I had ceramic coffee mugs that had Rowl, Scooter, Kermit, Fozzie, Miss Piggy, Sam the Eagle and Gonzo. The Muppets had three movies in the 80s (The Muppet Movie, The Great Muppet Caper and Muppets Take Manhattan -a personal favorite) then disappeared a bit. Came back in the 90s with the New Muppet Show that lasted for a couple of seasons, did a few more movies like A Muppet Christmas Carol, Muppet Treasure Island and Muppets from Space. Then they disappeared again except for the occasional TV movie or viral video (i.e. Bohemian Rhapsody). So it took Jason Segal (of How I Met Your Mother and Forgetting Sarah Marshall) to bring them back to pop culture relevance. Segal is a big Muppet fan and you can tell that he is in the script that he co-wrote with Nicholas Stoller. The plot of the movie is pretty much like any Muppet movie in the past in which the Muppets are putting on a show. But this time, their show is a telethon to raise $10 million so they can buy back the Muppet Studios (which has laid to waste over the years) from oil baron Tex Richman (Chris Cooper in a hilarious villainous role). At first Kermit is reluctant to do so but is convinced by uber Muppet fan Walter (who is a Muppet that happens to be brothers with a human, Gary (Segal). Walter and Gary are in LA with Gary’s girlfriend (Amy Adams) for their 10th Anniversary (Gary and Mary) and to see and tour the Muppet Studios (Walter). So Gary, Mary, Walter and Kermit set-off to reunite the gang in a hilarious sequence and montage. Along the way there is song and device from everyone including a rap from Chris Cooper. My favorite parts of the movie include Rowl’s reunion montage with the rest of the Muppet gang and Walter during the song Man or a Muppet. What makes me really love the Muppets is Segal and Stoller remind me why I loved them in the first place. There was a lot of self-referential humor, pop culture references with the Muppets, pretty funny musical sequences and seeing all the Muppets and their personalities shine even if you see favorites like Rowlf, Beaker or the Swedish Chef briefly. Also, I love seeing all the celebrity cameos. It was a homage to what all Muppet movies had in the 80s, celebrities of the day popping up. All of the celebrities in it made great use of their screen time. 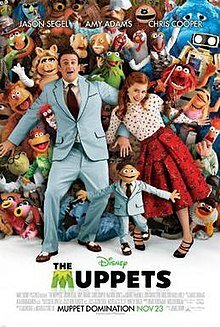 Even though you have Oscar-nominee Amy Adams in the film (I felt she was a bit of a waste in the film but still loved her in it) and Jason Segal, the real stars of the film are The Muppets and the new kid on the block Walter (he is pretty cute). I laughed so hard during this movie and throughout kept on thinking this is why I love the Muppets.